Appearance: dark black pour, no head. Taste: Some pumpkin, but mostly a weak porter. Ashy aftertaste. from a 3 month old single picked up in a bottle shop in Atlanta into a cervoise, pours a shiny obsidian, with a tinge of ruby when held in the light, a finger of khaki head that subsides quickly leaving a thin ring on top and no lacing. Nose is pretty elusive, very faint vanilla and allspice, a little leathery licorice, a little grain...it is all quite muted, though. Taste follows the nose, but there's also a little juicy stringy pumpkin. Nothing really emerges as a defining characteristic. It is balanced, I guess, but it is also a little nondescript. There are some acrid notes, which I often get from English porters, but it just isn't paired with any type of flavor, so...it just doesn't go anywhere, for me. Dries out at the end, and medium to thin body. Gets a little better as it warms, but all in all, this is just okay. Look: Pours dark and clear, but when held to the light there are deep reddish mahogany hues that glimmer. The head is tan and the abundance of which depends on the vigor of the pour. Smell: Light rosted grains, a touch of spices, and coco. Taste: Clean molassesy malt, underlying pumpkin, hit of spices, a bit of a vanilla warmth, and finally acrid charcoal. Feel: Medium, borderline-full body with a slick swallow and an acrid dry finish. Overall: Recently I had realized that I liked the idea of a Pumpkin beer better than any pumpkin beers I had tried, and I decided to no longer seek them out. 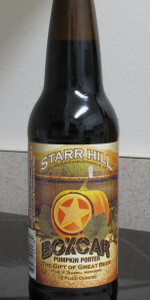 But this beer was excellent and made a lot of sense; the pumpkin was somehow not forced upon the beer. Very well done. I've had this in previous years and liked it enough, but I don't know, it just doesn't do it for me anymore. It looks good, dark brown/black with a tan, almost orange head. It smells like pumpkin spices. (What did you expect?) It tastes pretty bland. It's boring and nothing sticks out besides for some random pumpkin spices. Meh. The feel is pretty light, nothing really notable about it. Overall, this isn't bad, but it just isn't something I'll probably ever buy with my own money again. Look: Dark Black in color: Very large foamy off-white head. Pretty impressive in the glass. disappointing. Definitely a dry stout-like flavor: no sweetness, but not overly bitter either. Alcohol at 4.7 ABV is understandably very subdued. A- a very dark brown, but light penetrates the edges. Light khaki head that dissipates car to quickly. No lacing. S- Some dark malts, cocoa, mild brown sugar, nutmeg and cinnamon. T- Taste is lacking. It's a mediocre porter with a flash of cinnamon and nutmeg on the finish. M- Ample carbonation, but very thin. O- Disappointing, to say the least. Very little pumpkin character. Sampling a cellar temp 12 oz bottle poured into my snifter. THe beer pours a rich dark cola color with creamy beige head foaming up and fading to a sturdy edge layer soon after sampling. The aroma is predictably spicy with nutmeg, clove and some cinnamon. A little sweet malt balances the spices but there dont appear to be any hops to be found on the nose. First sip reveals an average body with smooth texture. the carbonation is fizzy and tingles my palate on each sip. Flavor is mild with a little chocolate malt and some brown sugar sweet that then rolls to a bit of dry chalky flavor and then finishes with some cinnamon spice and a bit of cloves. Finish dries out a bit on my mouth after each sip. The beer is average and I hoped it would have more malty porter backbone to boost the enjoyment, but there isnt really any flaws in this one. It just isnt exciting. Poured from a 12 ounce bottle into a Bear Republic tasting glass. Bottled 12 August 2015. It smells like pumpkins! Good, honest gourd. Hint of spice. This is fantastic!! Roasted-sweet. Lots of pumpkin. More pumpkin than Porter. Would definitely have again. I think they've improved the recipe in the last 3 years.